Serving the Muskoka Area for 40+ Years! aMac Signs has manufactured signs in Muskoka since 1969, with hand lettered signs up until 2000. This 3rd generation business was originally founded by James MacDonald, and is now run and operated by his son Mark and grandson Adam MacDonald. 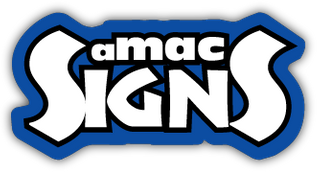 aMac Signs offers everything from truck lettering, bridge banners, storefront signs, highway billboards, manufactured signs, wood carved signs and more. If you are looking for advertising space locally in Muskoka, aMac Signs also offers highway spaces for lease. Please inquire for more details.